With the progression of technology came the implementation of augmented reality (AR) or virtual reality (VR). Augmented reality can be defined as “an enhanced view of the world, where digital information and interactions are added to the real world environment,” (HP). When you think of augmented reality, you may only associate it with wearing cool goggles; however, augmented reality is more frequently showing up as a display through means of your smartphone or tablet screen. It’s a new process that could prove to be more than just a trend, and perhaps be a game changer for a plethora of industries. “In 2016, an estimated 43 mmillion people will own VR products worldwide, and this is only set to grow to 170 million by 2018,” (DMN). So How Does This Bleeding-Edge Technology work? Augmented reality is based on tracking, which uses GPS or a type of satellite navigation system to determine your position. With such accurate GPS software installed on practically every device these days, tracking someone and creating an environment around them in an augmented reality setting is a simple endeavor. When it comes to tracking, augmented reality can be broken down into two types — marker-based and markerless tracking. With marker-based AR, “materials must be printed with the marker for the augmented reality experience to trigger,” whereas with markerless AR, any image can be used to trigger augmented reality experience, even those already printed,” (HP). “The real mission for commercial AR is integrating the technology so that it enhances the customer experience — making it easier, more fun, and more convenient,” (Harvard Business Review). Augmented reality has the potential to create real value and additional revenue for companies/brands. 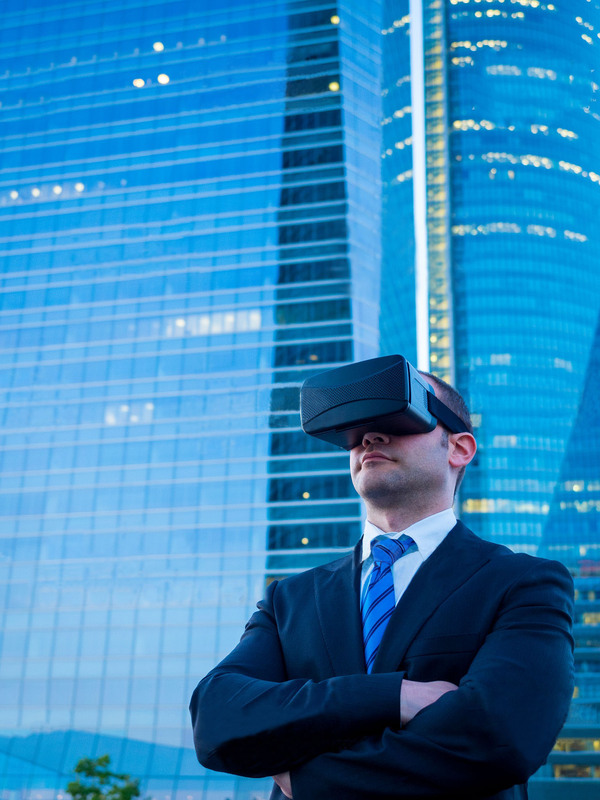 However, at the same time, it’s imperative that companies don’t just include AR into their marketing mix just for the sole purpose of including it. If marketers do that, they risk selling the technology more than their product. “ Mobile Marketer recommends brands steer clear of using it as just a silly gimmick. Instead, marketers should leverage the technology as a utility by ‘making it more interactive with multiple click-through,’” (Mittera Group). An app designed with AR has to make sense with the company’s goals and the consumer’s needs. 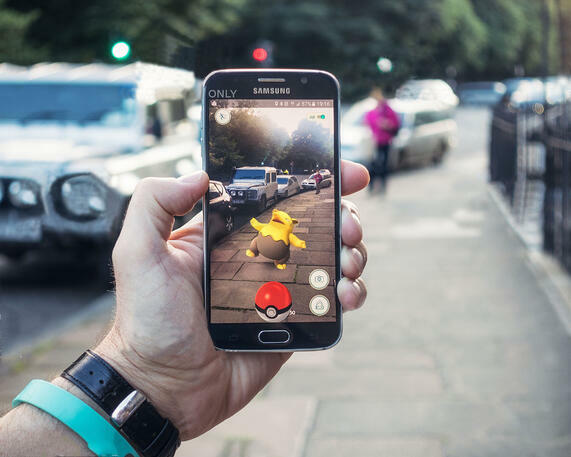 The gaming industry is currently using AR as a marketing tool with the purpose of revamping video and mobile games. The most popular mobile game that uses AR is the new Pokémon Go. This mobile game uses AR technology along with GPS function in the smartphone/device. “Pokémon Go prompts players to explore the real world in search of characters from the Pokémon franchise. After creating and designing an avatar, players view a main map that overlays real-world geographic details such as streets with in-game items and destinations, called PokéStops and Pokémon gyms. As the player moves in reality, the avatar moves on the AR map,” (Investopedia). There are certain retail stores that are also using AR as a fun way for customers to shop. 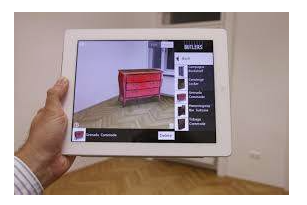 Wayfair, the home and décor retail store, has created an app that allows users to view full-scale models of products in their real settings through their smartphone or tablet. Ikea, the furniture store, also created an app, but it is used through their catalog. With this app, they can take a picture of the room they’re looking to add the furniture in, and then go peruse through the catalog and select a piece of furniture to see how it would look in the photographed room. American Apparel jumped on the AR train when developing their own app that lets customers scan an item and then view it in different colors. While the shoe company, Converse, made their app so that customers can select a shoe from the catalog and then point their phone at their feet to see how they would look in that shoe. De Beers Jewelry Company launched an app that gives shoppers the ability to try on collections through their webcam to see how pieces would look on different skin tones and in different lighting. If you conclude that adding augmented reality into your marketing plan is a good idea, you should make sure that you make it easy for consumers. Just because AR is an up-and-coming trend doesn’t mean that everyone knows how it works or how to use it. If you’re implementing AR into a catalog, you should inform them how to view the 2D pages in 3D, tell them what app to download, and educate them on how to scan the code. Put it in basic terms so it’s easy to understand and you don’t exclude anyone. You should also make sure that the AR is adding additional content, or once again, the focus will be taken off of your company and onto the technology itself. Most importantly, the intent is to make it fun. Entice consumers to engage with your brand, app, and products. 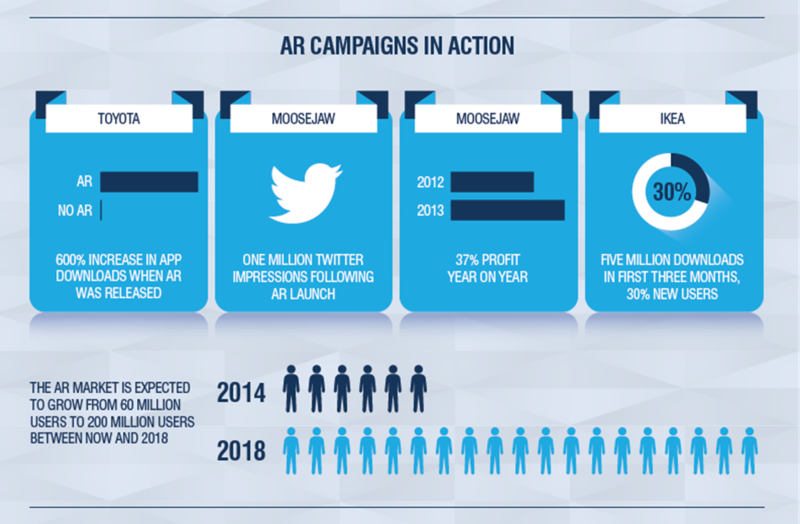 Remember, when used correctly, AR can yield successful marketing campaigns for products. Direct mail still racks up some of the best numbers when it comes to the statistics of consumer responses. If you begin adding digital elements into your direct mail campaigns, the numbers will only increase. “Integrating AR into a direct mail campaign can significantly enrich your campaign, while also enhancing the overall customer experience. Both AR and direct mail deliver significant benefits to the user, but in very different ways. While direct mail boasts the sensory and tactile properties that engage with customers on an emotional level, AR allows the user to virtually step inside the mailing, instantly allowing them to interact with a brand. Together, these qualities complement each other and allow for a seamless and integrated user experience. Direct mail acts as the driver, initially grabbing the customer’s attention and introducing the campaign, AR then brings the piece to life, providing instant gratification and further enhancing their overall brand experience,” (Howard Hunt). 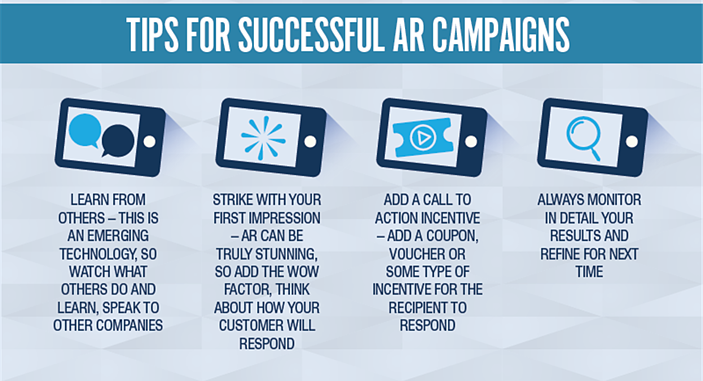 There are several benefits that come from using augmented reality in your direct mail pieces. They include: increasing buyer confidence, providing instant access to more detailed content, giving off the wow factor, improving your brand, encouraging active engagement and immediate action, and more effective ways of tracking/measuring results. If people want to participate in the augmented reality experience, they will follow the steps listed and become surrounded by more information about your company, product or brand. When consumers willingly research what your direct mail piece was about without you having to tell them in a follow-up email or other mail piece, it’s a winning solution already. Additionally, they might tell other people to check it out, and then you just extended the knowledge of your brand once more in an effortless fashion through word of mouth. Once they take part in the AR experience, consumers should have a better understanding of either your brand or the product itself. This understanding leads to trust, and trust turns into purchases, which ultimately leads to customer acquisition and retention. 1. Augmented reality is more than just a trend. It’s an up-and-coming form of technology that is projected to have staying power and dig its roots into several different industries. 2. Augmented reality is already being used in certain industries, like gaming and retail, to enhance user experiences and brand recognition. 3. It’s important to not use augmented reality as a marketing gimmick, or where it doesn’t make sense, because the focus will shift from your product/company to the actual augmented reality technology itself. 4. If augmented reality is being used as a marketing tool, make sure it’s adding substance to your campaign and that it’s integrated effectively. 5. Direct mail can produce better, longer lasting results when augmented reality is integrated within mailing pieces.